Friday Foto Fricassee: Picasso plus Hollywood equals TruLuv? Gwyneth is in talks to star in a film about Picasso’s Guernica, leading me to wonder (over on my other, more thematic Tumblr), does Gwenny + Pabs = Heart? Woody Allen proved with Midnight In Paris that it is possible to reincarnate beloved modernist artists themselves with charm and class, but whether Madame GOOP is the one to bring the work of Guernica its necessary gritty gravitas… well, I’m not sure. 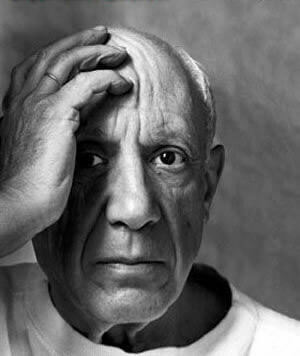 Either way it opens to the door to the exciting possibilities of cinematizing other famous Picasso pieces with US Weekly-grade celebs… and so, the Friday Foto Fricassee!